A spokesperson from the UN has confirmed it facilitated the handover of US journalist Theo Curtis, who was held in Syria for two years by an al Qaeda-linked group. In a statement, the UN spokesperson said: "He was handed over to UN peacekeepers in Al Rafid village, Quneitra, the Golan Heights, at 6:40 p.m. (local time) on 24 August 2014. After receiving a medical check-up, Mr. Curtis was handed over to representatives of his government." Particularly after a week marked by unspeakable tragedy, we are all relieved and grateful knowing that Theo Curtis coming home after so much time held in the clutches of Jabhat Al-Nusrah. For two years, this young American has been separated from his family. Finally he is returning home. Theo's mother, whom we've known from Massachusetts and with whom we've worked during this horrific period, simply refused to give up and has worked indefatigably to keep hope alive that this day could become a reality. American journalist Peter Theo Curtis has been released after two years being held in captivity by Syrian militants, US Secretary of State John Kerry has said. Mr Kerry said that the US were using "every diplomatic, intelligence and military tool" at its disposal to secure the released of other Americans held hostage. Kidnappers in Syria have released US hostage Peter Theo Curtis after Qatari efforts to win his freedom, Reuters reported citing Al Jazeera. Islamic State fighters have captured a major military airbase in north eastern Syria, according to the Associated Press. It eliminates the last government-held outpost in a province dominated by the extremist group, activists and state media said. "Some of the Syrian regime troops pulled out, and now the Islamic State is in full control of Tabqa," said Observatory director Rami Abdurrahman. "This makes Raqqa province the first to fully fall out of government hands." A car bomb killed seven people in a mostly Shi'ite area of Baghdad, police and medical sources said. Police said the car bomb exploded in a commercial area of the Shu'ala district in northwest Baghdad. Iraqi's new prime minister Haider al-Abadi and visiting Iranian Foreign Minister Mohammad Javad Zarif have discussed the need for international efforts to eliminate Islamic State. Bombings across Iraq killed at least 35 people in attacks that appeared to be revenge for an assault on a Sunni mosque that has deepened sectarian conflict. A bomb exploded in Arbil, the capital of Iraq's Kurdistan region, which has enjoyed a relative stability. A bomb exploded in the capital of Iraq's Kurdistan region, Arbil, local television network Rudaw reported. TV footage showed firefighters dousing the charred remains of a car. 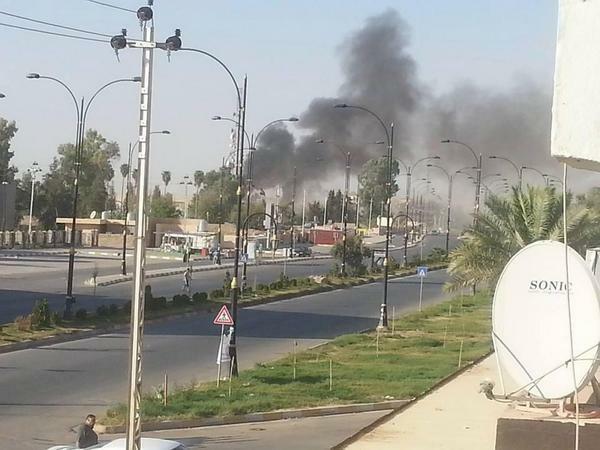 According to Reuters, a cloud of smoke was spotted in Arbil, but it was not clear whether it was from a blast. Three bombings that appeared to be targeting Kurdish forces killed six people in the city of Kirkuk, 250 km (155 miles) north of Baghdad, security sources said. In Baghdad, a bomber rammed a vehicle into an intelligence headquarters on Saturday, killing at least eight people, police and medical sources said. Near Tikrit, a suicide bomber driving a military Humvee packed with explosives attacked a gathering of soldiers and Shi'ite militias on Friday night, killing nine.